I never liked Oahu until a couple years ago when instead of hanging out in Honolulu, we hung out at Kailua — a more laid back residential area on the East side of Oahu home to Waimanalo, Kailua beach, and the quiet yet famous and well photographed Lanikai beach. Waikiki was just too much of a tourist trap, trafficky, too busy. I don't believe there are any hotels in Kailua. Anyway, we haven't gotten to explore the North Shore, nor much of the west side and central parts of Oahu and still haven't gone surfing so maybe another trip. But actually, would love to buy rental property in Kailua. Someday. I think a trip to the Big Island is next though. Continue reading "Oahu trip '08"
Books I read while on the beach…tough life. Finished reading Crucial Conversations, a good book on talking through tough topics. The Audacity of Hope, I bought a long time ago but just got around to reading it. Re-read the Paradox of Choice and still learning to become a satisficer which is the maximizer strategy anyway. I could use some more book recommendations if you have them. 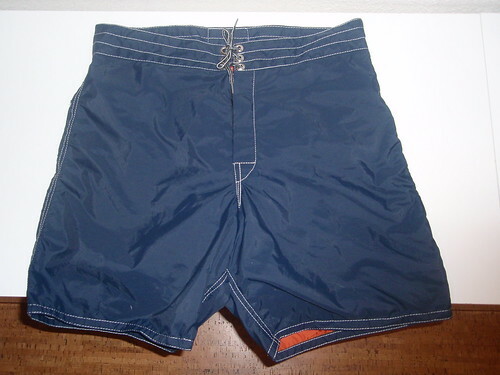 303: Surfnyl, Navy Blue, 34"
Birdwell Beach Britches fascinates me. The company has a great story, they make great products, have a cool logo, they have a super old school web site (which worked fine for me), and I won't buy any beach shorts from anywhere else. I've got three pairs, and when I lose weight I'll probably get another two more pairs hopefully at size 32". What makes them great shorts: they're fitted and comfortable, the Surfnyl material dries fast (like 5 minutes tops), they're lined, and they feel and look well made (in terms of the stitching and materials used). What I've been finding is that there are many small companies like Birdwell Beach Britches that makes great products, at a high quality, at a great price, and with personality. Getting emails back from the owners is normal and a web site only matters in that it's up and running and more/less functional. Berkshire Hathaway's web site is a perfect example. The other piece that interests me is the notion of maximizer and satisficer. I'm a maximizer (unfortunately): I want the best of things, the best value, the best price, and products that last. It's borderline obsessive/compulsive but really I'm just super cheap. A satisficer (who's generally happier, less stressed, less compulsive) could go to Target or Walmart or anywhere and get a pair of swim trunks. I had to go online, mostly because swim trunks at stores always have dumb prints on them and I wanted something basic. I could have only found these shorts being a maximizer and being one is probably a good thing when buying a house, car, or other big ticket items. Mozilla Messaging today announced the beta launch of the SpreadThunderbird.com web site. Spread Thunderbird is the volunteer-run Mozilla Thunderbird advocacy site where community marketing activities are organized to raise awareness and to promote the adoption of Thunderbird. The Spread Thunderbird site is powered by the open source Drupal web site software. 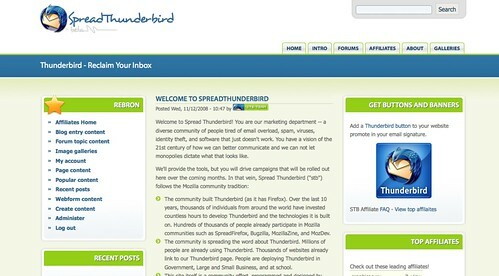 Community members may submit ideas and join in the effort by visiting http://www.spreadthunderbird.com.